2010 Census Shows Nearly Half of American Indians and Alaska Natives Report Multiple RacesThe U.S. Census Bureau today released a 2010 Census brief, The American Indian and Alaska Native Population: 2010, [PDF] that shows almost half (44 percent) of this population, or 2.3 million people, reported being American Indian and Alaska Native in combination with one or more other races. This multiracial group grew by 39 percent from 2000 to 2010. Overall, 5.2 million people, or 1.7 percent of all people in the United States, identified as American Indian and Alaska Native, either alone or in combination with one or more races. This population grew by 27 percent from 2000 to 2010. Those who reported being American Indian and Alaska Native alone totaled 2.9 million, an increase of 18 percent from 2000 to 2010. The multiple race American Indian and Alaska Native population, as well as both the alone and alone-or-in-combination populations, all grew at a faster rate than the total U.S. population, which increased by 9.7 percent from 2000 to 2010. A majority of the American Indian and Alaska Native alone-or-in-combination population (78 percent) lived outside of American Indian and Alaska Native areas. At the same time, most counties with relatively higher proportions of American Indians and Alaska Natives tended to be in close proximity to reservations, trust lands or Oklahoma tribal statistical areas. This was especially evident in counties throughout the West and in Oklahoma. The 10 states with the largest American Indian and Alaska Native alone-or-in-combination population in 2010 were California, Oklahoma, Arizona, Texas, New York, New Mexico, Washington, North Carolina, Florida and Michigan. Among these states, Texas, North Carolina and Florida experienced substantial rates of growth in this population at 46 percent, 40 percent and 38 percent, respectively. The American Indian and Alaska Native alone population experienced growth of at least 20 percent in Texas, North Carolina, Florida and New York. The multiple-race American Indian and Alaska Native population increased by more than 50 percent in 18 states. North Carolina, Delaware and South Dakota experienced the most rapid growth in this population at more than 70 percent. 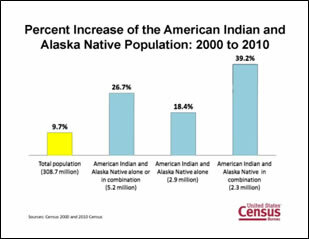 In all but three states, the multiple-race proportion of the American Indian and Alaska Native alone-or-in-combination population increased from 2000 to 2010. The largest number of people who identified with an American Indian tribal grouping, either alone or in combination, identified as Cherokee (819,000). The Navajo tribal grouping had the largest number of individuals who identified with one tribal grouping and no other race (287,000). Among the largest American Indian tribal groupings, Blackfeet had the highest proportion who reported more than one tribal grouping or race. Seventy-four percent of Blackfeet individuals reported an additional race and/or tribal grouping. The largest Alaska Native tribal grouping, either alone or in combination, was Yup'ik (34,000), followed by Inupiat (33,000). Yup'ik also had the greatest number of people who identified with one tribal grouping and no other race (29,000). Among all Alaska Native tribal groupings, Tlingit-Haida had the highest proportion who reported more than one tribal grouping or race. Forty-two percent of Tlingit-Haida individuals reported an additional race and/or tribal grouping.Comment: Media reports about this release keyed on the multiple-race finding. But I'm not sure why everyone's treating it as big news. I think it came out in the initial reports last year: 5.2 Million Indians in 2010 Census. And a partial explanation, too: More Latinos Identify as Native. There are no revelations in this data, but the "where they live" figure is interesting. For years I've been saying the proportion of Indians living off-rez was around two-thirds or 70%. The 78% figure tells us how well-integrated Indians are into society. All the ancient stereotypes--e.g., that they live in tipis--and modern stereotypes--e.g., that they're poor welfare recipients--are that much less true. Americans imagine Indians living out in the wilderness somewhere, usually in a desert with buttes and mesas. But reservation Indians are the exception, not the rule. While people are daydreaming about buckskin-wearing savages, real Indians are right next to them--at the office, at school, or at Starbucks. And the majority of those Natives that do reside in the cities/urban areas(non-tribal areas), are either employed or a student of some institution. Which is rarely talked about or mentioned. The majority of those on welfare programs are generally Whites and Blacks. But it's based on the populace of each race. Natives in most urban areas make up less than 5% of the population.